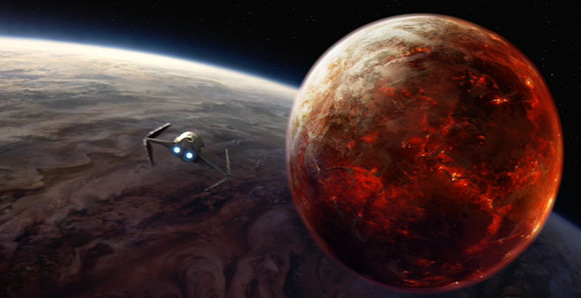 Jestefad is the first planet in the Mustafar system. Located in the Outer Rim, this immense gas giant was considered the twin of the planet Mustafar, but only because they shared almost the same orbital pathways. Jestefad was the innermost planet of the Mustafar System, and many astrophysicists considered Mustafar to be one of its moons. However, the gravitational forces imposed on the small planet by Lefrani, the outermost planet in the system, kept Mustafar separated from Jestefad and on its own orbital path.